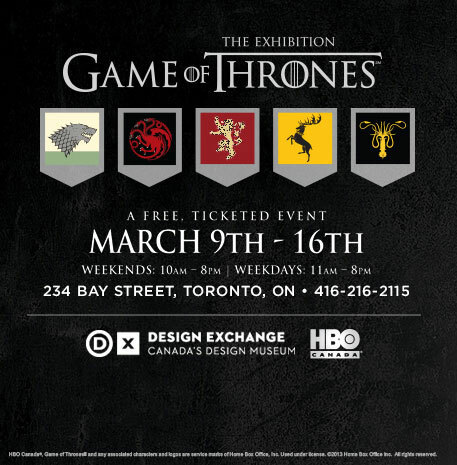 The traveling exhibit -- the first of its kind by HBO -- has been created to bring the show to life to five international cities: Toronto, Canada; New York City, New York; Sao Paulo, Brazil; Amsterdam, North Holland and Belfast, Northern Ireland. According to the press release, "Presented by HBO and international partners, the exhibition is free to the public and focuses on key characters from five of the noble houses (Stark, Lannister, Targaryen, Baratheon and Greyjoy), showcasing a treasure trove of more than 70 original artifacts from seasons 1 and 2, plus select pieces from this year’s new season." Beyond getting to check out costumes, props, armor and weapons crafted for the series based on George R.R. Martin's "A Song of Ice and Fire" novels, thronies will also be able to pop a squat and take a pic on an exact replica of the Iron Throne. Plus, remember that epic Blackwater battle scene from Season 2? The exhibit offers a Blackwater Bay interactive experience where fans will get to "participate in an exciting interactive experience that will place them amid the action of the epic battle..."
Collectible merchandise will also be available through the HBO Shop. For tour dates and venues, go beyond the jump, which is kind of like our very own Wall.